Nara Rohit is on a high with back to back releases this year. Appatlo Okadundevadu has Nara Rohit in a prominent role along with Sree Vishnu and Tanya Hope playing the lead roles. The film has managed to attract the audience and industry insiders alike with its gripping trailer and first look poster. Sagar K Chandra of Ayyare fame has directed this film which is releasing today amidst huge expectations. Railway Raju (Sree Vishnu) is an aspiring cricketer who desperately waits for getting selected into Ranji Team from Hyderabad. 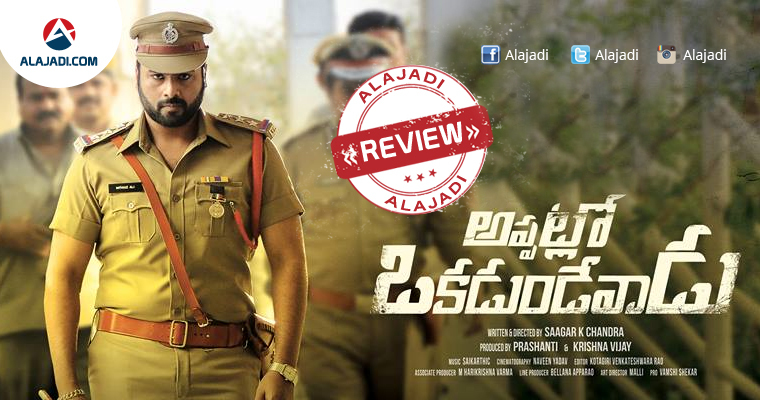 On the other side, Imtiaz (Nara Rohith) is a police officer who fights against the Naxals. Railway Raju truns into a criminal owing to unexpected circumstances. This leads to a tiff between Imtiaz Ali and Raju. The story revolves around the circumstances that forced Raju to turn into a criminal, how he overcomes them to achieve his goal. The film reminisces us of the 1990’s and is a great experience to watch on screen. Nara Rohit and Sree Vishnu make the movie a must watch. The film is surely going to be a path breaker in the Telugu film industry. The way Sagar Chandra, the director of the film connected the events with true incidents through a unique screenplay is excellent. Appatlo Okadundevadu has so many good moments for which you will be amazed. Nara Rohit: He impressed everyone with his ferocious acting abilities and he experimented with an altogether new look and role in this film. Sree Vishnu: He surprised everyone with his acting prowess and stood out as one of the success factors of the film. Tanya Hope: She delivered good performance although her role had limited scope to perform. Brahmaji, Rajeev Kanakala, Ajay, Srinivas Reddy, Gv, Satyadev, and rest of the cast have done justice to their roles. Director Sagar K Chandra seemed to have worked expensively on the plot and script, set in the 1990’s backdrop. Screenplay and making are excellent and lead to the success of the film. He could extract the best out of every actor in the film. The music by Sai Karthik just seemed okay. The, background music could hold the gripping plot and raise curiousness in the audience. Cinematography seemed decent. Editing by Kotagiri Venkateswara Rao is really good. Production values by Prashanti and Krishna Vijay are excellent.